It’s almost time to go back to school! Who’s excited?! I bet all you moms are. This week we will be featuring some easy back to school snacks and meals that are easy to put together and healthy too! 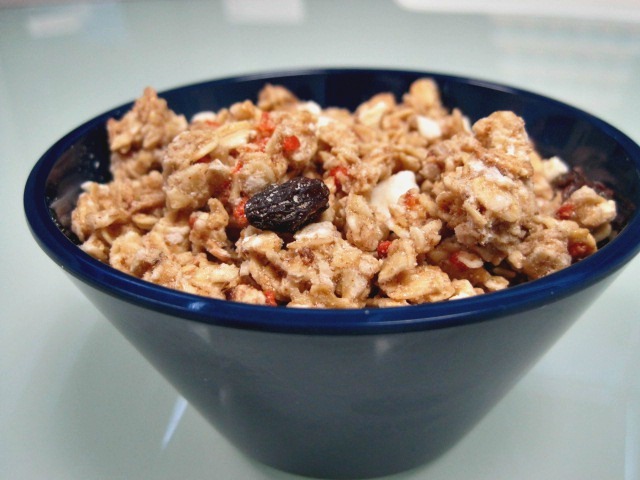 Today’s recipe is homemade granola, the perfect after school snack. 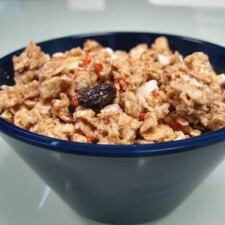 Granola is so easy to make and you can put whatever you want in it. Get creative! The recipe below is a basic recipe, you can take out or add whatever you want. Preheat oven to 325 degrees. Mix together all dry ingredients except for the dried fruits. In a small, separate bowl mix together the coconut oil and agave. Pour the coconut oil mixture over the rest of the ingredients and mix until well combined. Prepare a baking sheet by lightly spraying with Kelapo coconut oil nonstick spray. Spread granola evenly across large cookie sheet. Bake for 30 minutes or until golden brown. Stir twice throughout cooking process so granola is evenly browned. Let cool. Mix in any dried fruits and enjoy! Store in an airtight container. What do you mix into your homemade granola?